Definition, Characteristics, History of Neoclassicism. Museum of Fine Arts, Leipzig. symbolist painting by Max Klinger. Old Masters (Painters to 1830). Neoclassical painting typically involved an emphasis on austere linear design in the depiction of classical events, characters and themes, using historically correct settings and costumes. Its emergence was greatly stimulated by the new scientific interest in classical antiquity that arose during the course of the 18th century. A series of remarkable archeological discoveries, notably the excavation of the buried Roman cities of Herculaneum (begun 1738) and Pompeii (begun 1748), caused an upsurge of renewed interest in Roman art. Furthermore, from around 1712 onwards, several influential publications by Bernard de Montfaucon (1655-1741), Giovanni Battista Piranesi (1720-78), the Comte de Caylus, and Robert Wood provided engravings of Roman monuments and further heightened interest in classicism and classical antiquity. All this helped scholars to establish a more accurate chronology for Greco-Roman art, whose numerous strands and styles stimulated greater respect for the culture of the period. The enthusiastic writings of the German historian and scholar Johann Joachim Winckelmann (1717-68) were particularly influential in this regard and rapidly established him as the champion of Greek art, and of the latent style of Neoclassicism. Neoclassicism as expressed in painting developed in different ways to neoclassical sculpture or architecture. The latter genres were based on actual prototypes which had survived from antiquity. 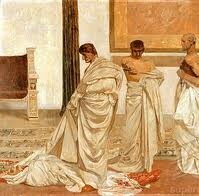 But almost no paintings had been found to survive, until, that is, the excavations at Herculaneum and Pompeii. The earliest painters of the neoclassical school were centred round Winckelmann and Anton Raphael Mengs (1728-79) in Rome. They included the Frenchman Joseph-Marie Vien (1716-1809) (whose pupils included J-L David), the Italian portraitist Pompeo Girolamo Batoni (1708-87), the Swiss artist Angelica Kauffmann (1741-1807), and the Scotsman Gavin Hamilton (1723-98), all of whom were active in the 1750s, 60s, and 70s. And while their compositions typically included poses and figurative arrangements from Greek sculpture and vase paintings, they were still strongly influenced by the preceding rococo. The style of Kauffmann's pretty, sentimental paintings, for instance, is barely distinguishable from much rococo art. (Self-Portrait Torn Between Music and Painting, 1792, Puskin Museum of Fine Arts.) Even its classical scenes have a rococo-type lightness. (Cornelia, Mother of the Gracchi, 1785, Virginia Museum of Fine Arts, Richmond.) The same might be said of the work of Elisabeth Vigee-Lebrun (1755-1842). Another case in point is the neoclassical painting Parnassus (1761; Villa Albani, Rome) by Mengs, which borrowed heavily from 17th-century classicism as well as the High Renaissance master Raphael. Moreover, despite Mengs's apparent agreement with Winckelmann's theory of Greek aesthetics, the style he used in most of his church and palace ceilings was more akin to existing Italian Baroque traditions than to ancient Greece. Other influences included works by the great Nicolas Poussin (1594-1665), the greatest French painter of the 17th century, whose own brand of classical history painting set the standard in academic art for generations and became the embodiment of French classicism. His contemporary in Rome, and an equally important influence on neoclassicism, was Claude Lorrain (1600-82), whose Italianate landscapes - filled with biblical and mythological narrative - inspired a wide range of successors, including JMW Turner. A purer more rigorous school of Neoclassical painting appeared in France in the 1780s under the leadership of Jacques-Louis David (1748-1825). He and his contemporary Jean-Francois Peyronwere more interested in narrative painting than the ideal forms that fascinated Mengs. During the late 1780s and early 90s - coinciding with the outbreak of the French Revolution - Jacques-Louis David and other painters borrowed inspirational subjects from Roman republican history in order to celebrate the values of simplicity, austerity, heroism, and stoicism - the same values that were being asserted at the time in connection with the French struggle for liberty. 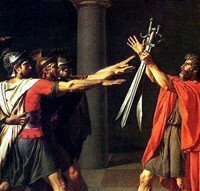 Thus David's historical compositions like the Oath of the Horatii (1784, Louvre, Paris) represent a strong sense of gravitas, as well as a certain rhetorical quality of posture and gesture, along with patterns of drapery that owe much to Greek sculpture. If some of these elements had already been seen in works by British and American painters like Hamilton and West, the figurative confrontations in J-L David's pictures are much more dramatic: not only are they starker and in clearer profile on the same plane, and set out against a more monumental background, but also there is nothing to be seen of the distinctive features of Baroque painting, such as diagonal compositional movements, large groups of figures, and flamboyant drapery. Unlike the early Italian neoclassicism produced in Rome, this later French style of neoclassical painting was far more uncompromising, and pared down to its austere essentials - quite in keeping with the ruthless cultural vision of the French Revolution. See also David's masterpiece Death of Marat (1793, Musees Royaux des Beaux Arts, Brussels). This neoclassical austerity is aptly illustrated in the emotionally detached works of the great Neoclassical painter Jean-Auguste-Dominique Ingres (1780-1867). Ingres produced a large number of portraits and subject paintings - using a variety of classical and oriental themes - which were heavily dependent on linear design, a shallow picture plane and muted colours. Even his supposedly sensuous nudes, like The Turkish Bath (1862, Louvre) or La Grande Odalisque (1814, Louvre) are essentially cold compositions, brilliantly executed. See also his Valpincon Bather (1808, Louvre) and the cool but colourful Portrait of Madame Moitessier (1856, National Gallery, London). Other neoclassical painters included the expatriate American history painter Benjamin West (1738-1820), as well as the French artists Jean-Germain Drouais (1763-88) and Anne-Louis Girodet de Roucy-Trioson (1767-1824), both pupils of J-L David. The latter's top pupil, Antoine-Jean Gros (1771-1835), was also associated with classical academic art, although in his colour and composition he leaned strongly towards Romanticism, and had an influence on Delacroix. See also: Neoclassical sculptors (1750-1850). Where 17th century Baroque painters made full use of the dramatic qualities of colour, atmosphere and light - witness its reliance on tenebrism and chiaroscuro - neoclassical painters, at least by the 1790s, emphasized outline and linear design. Widely available prints of classical sculptures and painted Greek pottery helped to shape this bias, which can be clearly seen in the simplified illustrations made by the English sculptor John Flaxman (1755-1826) for editions of works by Homer and Aeschylus. These drawings are marked by their reduced pictorial space, and minimal stage setting, as well as an austere linearity in their depiction of the human form, a style later borrowed by several other figurative painters, such as the Swiss-born romantic painter Henry Fuseli (1741-1825) and the English romantic William Blake (1757-1827), among others. The Neoclassical painting school attached great value to the historical accuracy of costumes, settings, and background details in their compositions - a principle which could be applied easily enough to events taken from Greek mythology or Roman history, but which ran into controversy when applied to contemporary settings: after all, why should a modern hero be dressed in Roman clothes? This question was never satisfactorily overcome, except perhaps in J-L David's paintings such as Portrait of Madame Recamier (1800, Louvre). Most of the subject matter of neoclassicism painting was furnished by the history and mythology of ancient Greece and Rome, as it appeared in poetry by Homer, Virgil, and Ovid; plays by Aeschylus, Sophocles, and Euripides; and historical accounts by Pliny, Plutarch, Tacitus, and Livy. Of these works, the single most important source was the Greek writer Homer, author of Iliad and Odyssey in the 8/9th century BCE. Other subjects included events from medieval history, works by Dante, and a deep appreciation for Gothic art. NOTE: For the impact of neoclassicism on 20th century painting, see: Classical Revival in modern art (1900-30). For works by the leading contributor to classicist painting of the modern period, please see: Neoclassical Figure Paintings by Picasso (1906-30), of which major examples include: Two Nudes (1906, Museum of Modern Art, NY); Seated Woman (Picasso) (1920, Musee Picasso, Paris); Large Bather (1921, Musee de l'Orangerie, Paris); and Two Women Running on the Beach (1922, Musee Picasso, Paris).  For information about antique painting and sculpture, see: Homepage.